For proof that the future is now, look no further than photovoltaic glass. This cutting-edge technology essentially transforms glass into solar panels that convert light into electricity. Lest there be no misunderstanding, the answer is yes. We are talking about windows that generate their own power. It’s clean, green, and very cool. Photovoltaic glass incorporates transparent semiconductor-based photovoltaic—or solar—cells by sandwiching them between two sheets of glass. The degree of transparency is not 100% but some available light does filter through. Buildings with a substantial number of photovoltaic panels could potentially produce some of their own sustainable energy, reducing not only their energy costs, but also their carbon footprint. In climate zones, where too much glass in a building would create a heat issue, this reduced transparency could also save on air conditioning costs. For projects in which more light is desired, fabricators are rising to the occasion with variations, like slitted glass, that has gaps between the solar cells to allow for greater light penetration. Available with double or triple glazing, and in a variety of different colors, gradients, and patterns, photovoltaic glass can be easily integrated into 21st century building aesthetics. Forward thinking designers at Polysolar are making practical use of emerging glass science with the first solar bus shelter. Made completely of photovoltaic glass, the London bus shelter can generate 2,000 Kilowatt hours per year. To put those numbers in perspective, that’s enough to power an average London home. 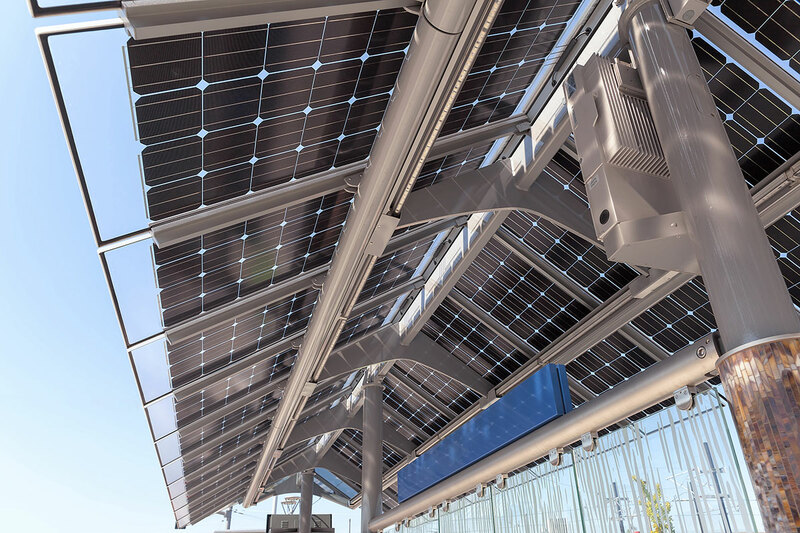 And thanks to the newest version of photovoltaic technology, the bus shelter solar cells continue to provide power even in low and ambient light. Starting small, but aiming high, Polysolar plans to implement pv glass in bus shelters, EV charging canopies, walkways, bike parks and high-rise buildings all across London in hopes of ultimately reducing the city’s carbon emissions. 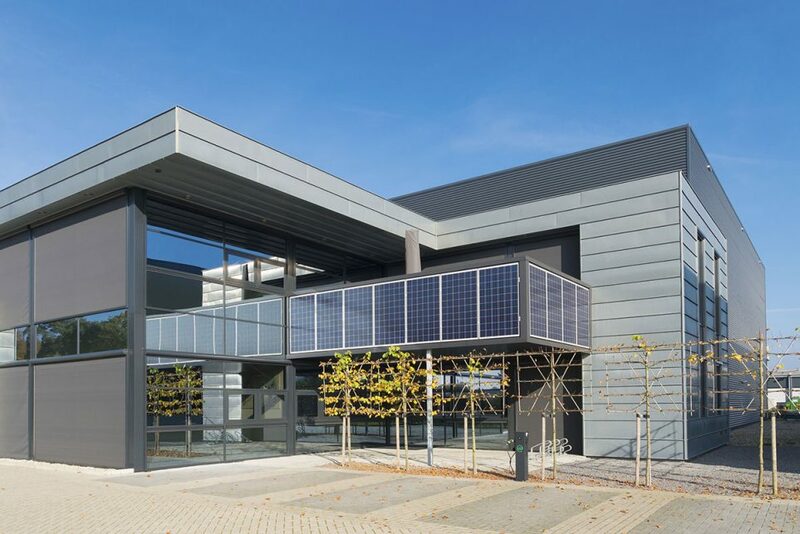 The planned Geneva Operational Center for Doctors Without Borders does more than integrate photovoltaic glass into its architecture. It boosts the concept to a different stratosphere altogether. As winners of an international competition for the project, Steven Holl Architects and Russli Architekten have collaborated to create an inspirational and innovative multi-colored photovoltaic glass façade system that can only be described as otherworldly. Nicknamed “Colors of Humanity,” the energy efficient building will be home to more than 250 employees. The building’s spectacular façade combines pv glass in varying degrees of permeability to best enhance the interior spaces while providing energy, shade and color. Together with the photovoltaic panels that wrap onto the top of the roof, the solar cells on the façade will produce enough power to provide up 72% of the electricity needed for building operations. The project is expected to get underway by Spring of 2019 and promises an interior that is as innovative and challenging architecturally as the exterior. Stunning, energy efficient and environmentally friendly, photovoltaic glass architecture is poised to take center stage in the design world. The skyscraper’s the limit.